A person's ability to focus on near objects gradually declines throughout life, with symptoms of this diminished ability usually noticeable by 40 to 45 years of age. Presbyopia is a gradual, age-related vision condition where the eye exhibits a progressively diminished ability to focus on near objects as one gets older. Presbyopia is not an eye disease, but rather, similar to gray hair and wrinkles, it is a normal part of aging. Symptoms usually are noticeable by 40 to 45 years of age but the processes eventually stabilize some ten to twenty years later (Souder 2002). Presbyopia's exact cause is known with certainty; however, research evidence most strongly supports a loss of elasticity of the crystalline lens. However, changes in the lens's curvature from continual growth as well as loss of power of the ciliary muscles (the muscles that bend and straighten the lens) have also been postulated as causal or contributing factors. As with all living things, human beings pass through various stages in life: birth, baby, young child, adolescent, young adult, adult, elder, and then death. The presence of gray hair, wrinkles, and presbyopia does not have to be seen in a negative light. Rather, such phenomena helps to remind even the most healthy individual that the physical body has a limited lifespan and thus to think of the legacy they wish to leave and how they want to spend their time on earth. A young person rarely thinks toward such matters, but the various reminders of aging helps to put one's life into perspective and rearrange priorities. The crystalline lens, or simply lens, is a transparent, biconvex (lentil-shaped) structure in the eye that, along with the cornea, helps to refract light to be focused on the retina. The lens, by changing shape, functions to change the focal distance of the eye so that it can focus on objects at various distances, thus allowing a sharp real image of the object of interest to be formed on the retina. The lens is located in the anterior segment of the eye. Anterior to the lens is the iris, which regulates the amount of light entering the eye. The lens is suspended in place by the zonular fibers, which attach to the lens near its equatorial line and connect the lens to the ciliary body. Posterior to the lens is the vitreous body, which, along with the aqueous humor on the anterior surface, bathes the lens. The lens is flexible and its curvature is controlled by ciliary muscles through the zonules. By changing the curvature of the lens with these tiny ciliary muscles, one can focus the eye on objects at different distances from it. This process is called accommodation. At short focal distances, the ciliary muscles contract, zonule fibers loosen, and the lens thickens, resulting in a rounder shape and thus high refractive power. Changing focus to an object at a distance requires the stretching of the lens by the ciliary muscles, which flattens the lens and thus increases the focal distance. Note that there is some confusion in various articles and textbooks over how the focusing mechanism of the eye actually works. In the classic book, Eye and Brain (Gregory 1994), the lens is said to be suspended by a membrane, the zonula, which holds it under tension. The tension is released, by contraction of the ciliary muscle, to allow the lens to fatten for close vision. This would seem to imply that the ciliary muscle, which is outside the zonula, must be circumferential, contracting like a sphincter, to slacken the tension of the zonula pulling outwards on the lens. This is consistent with the fact that our eyes seem to be in the "relaxed" state when focusing at infinity, and also explains why no amount of effort seems to enable a myopic person to see further away. Many texts, though, describe the ciliary muscles (which seem more likely to be just elastic ligaments and not under any form of nervous control) as pulling the lens taut in order to focus at close range. This has the counterintuitive effect of steepening the lens centrally (increasing its power) and flattening peripherally. In optics, the closest point at which an object can be brought into focus by the eye is called the eye's near point. A standard near point distance of 25 centimeters is typically assumed in the design of optical instruments, and in characterizing optical devices such as magnifying glasses. The ability to focus on near objects declines throughout life, from an accommodation of about 20 dioptres (ability to focus at 50 millimeters away) in a child to ten dioptres at 25 (100 millimeters) and leveling off at 0.5 to one dioptre at age 60 (ability to focus down to one to two meters only). Presbyopia is the term for the condition where there is a gradual loss of the eye's ability to focus on close objects due to old age. Presbyopia comes from the Greek word "presbys" (πρέσβυς), meaning "old eye" (Souder 2002) or "old person." It is believed that the major cause of presbyopia is the loss of elasticity of the lens. 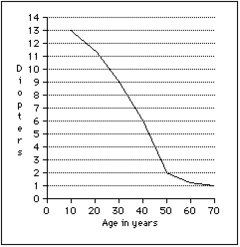 As people age, the crystalline lens becomes less elastic and less flexible. In addition, the ciliary muscles become less powerful, and this is believed to contribute to the condition. Because of these reasons, there is inadequate adjustment of the lens for close distances and objects appear blurry (Souder 2002). The symptoms are usually first noticed between the ages of 40-45 (Souder 2002). The first symptoms most people notice are difficulty reading fine print (particularly in low light conditions), eyestrain when reading for long periods, blur at near viewing distances, and momentarily blurred vision when transitioning between viewing distances. Many advanced presbyopes complain that their arms have become "too short" to hold reading material at a comfortable distance (Abel 2002). Presbyopia, like other focus defects, becomes much less noticeable in bright sunlight. This is a result of the iris closing to a pinhole, so that depth of focus, regardless of actual ability to focus, is greatly enhanced, as in a pinhole camera that produces images without any lens at all. Another way of putting this is to say that the circle of confusion, or blurredness of image, is reduced, without improving focusing. A delayed onset of seeking correction for presbyopia has been found among those with certain professions and those with miotic pupils (Garcia Serrano et al. 2002). In particular, farmers and housewives seek correction later, whereas service workers and construction workers seek eyesight correction earlier. Diagnosis of presbyopia is by an eye examination by a optometrist, ophthalmologist, or other eye specialist. Corrective lenses. Presbyopia is not routinely curable—though tentative steps toward a possible cure suggest that this may be possible—but the loss of focusing ability can be compensated for by corrective lenses including eyeglasses or contact lenses. In subjects with other refractory problems, convex lenses are used. In some cases, the addition of bifocals to an existing lens prescription is sufficient. As the ability to change focus worsens, the prescription needs to be changed accordingly. Half-glasses also can be worn, in which the top is left open and used for distance vision. In order to reduce the need for bifocals, trifocals, or reading glasses, some people choose contact lenses to correct one eye for near and one eye for far with a method called "monovision." If the eyes are normal for distance vision, the person may wear only one contract lens for the near vision. The brain adapts to having one eye focus for near and one for distant objects and will use the correct eye depending on the object being viewed (Souder 2002). Monovision sometimes interferes with depth perception. There are also bifocal or multifocal contact lenses that attempt to correct both near and far vision with the same lens, such as the upper portion of the lens for viewing distant objects and the lower for reading and near objects (Li et al. 2006). Bifocal contact lens requires that the lens not rotate in the eye, and thus not everyone is a candidate for such lenses (Souder 2002). Eye exercizes. Controversially, eye exercises have been quoted as a way to delay the onset of presbyopia or reverse the symptoms of presbyopia (Gottlieb 2002). Nutrition. At least one scientific study reported that taking lutein supplements or otherwise increasing the amount of lutein in the diet resulted in an improvement in visual acuity (Olmedilla et al. 2003), while another study suggested that lutein supplementation might slow aging of the lens (Berendschot et al. 2002). Lutein is found naturally in both the lens of the eye and the macula, the central area of the retina. Surgery. New surgical procedures may also provide solutions for those who do not want to wear glasses or contacts, including the implantation of accommodative intraocular lenses (IOLs). Scleral expansion bands, which increase the space between the ciliary body and lens, have not been found to provide predictable or consistent results in the treatment of presbyopia (Malecaze et al. 2001). Many people with myopia (nearsightedness, ability to see close objects but far objects are blurred) are able to read comfortably without eyeglasses or contact lenses even after age 40. However, their myopia does not disappear and the long-distance visual challenges will remain. Myopes with astigmatism will find near vision better though not perfect without glasses or contact lenses once presbyopia sets in, but the greater the amount of astigmatism the poorer their uncorrected near vision. Myopes considering refractive surgery are advised that surgically correcting their nearsightedness may actually be a disadvantage after the age of 40 when the eyes become presbyopic and lose their ability to accommodate or change focus because they will then need to use glasses for reading. A surgical technique offered is to create a "reading eye" and a "distance vision eye," a technique commonly known in contact lens practice as monovision. Abel, R. 2004. The Eye Care Revolution: Prevent and Reverse Common Vision Problems. New York: Kensington Books. ISBN 0758206224. Berendschot, T. T. J. M., W. M. R. Broekmans, I. A. A. Klöpping-Ketelaars, A. F. M. Kardinaal, G. van Poppel, D. van Norren. 2002. Lens aging in relation to nutritional determinants and possible risk factors for age-related cataract Arch Ophthalmol. 120: 1732-1737. Retrieved August 9, 2008. Garcia Serrano, J. L., R. R. Lopez, and T. Mylonopoulos Caripidis. 2002. Variables related to the first presbyopia correction Arch Soc Esp Oftalmol. 77(11): 597-604. PMID 12410405. Retrieved August 9, 2008. Gottlieb, R. 2002. Bye bye presbyopia Robert Silverman. Retrieved August 9, 2008. Gregory, R. L. 1994. Eye and Brain: The Psychology of Seeing. Oxford: Oxford University Press. ISBN 0198523408. Li, G., et al. 2006. Switchable electro-optic diffractive lens with high efficiency for ophthalmic applications. Proceedings of National Academy of Sciences USA 103: 6100-6104. Malecaze, F. J., C. S. Gazagne, M. C. Tarroux, and J. M. Gorrand. 2001. Scleral expansion bands for presbyopia Ophthalmology 108(12): 2165-71. PMID 11733253. Retrieved August 9, 2008. Olmedilla, B., F. Granado, I. Blanco, and M. Vaquero. 2003. Lutein, but not α-tocopherol, supplementation improves visual function in patients with age-related cataracts: A 2-y double-blind, placebo-controlled pilot study Nutrition 19(1): 21-24. Retrieved August 9, 2008. Souder, E. 2002. Trachoma. Pages 2713 to 2715 in J.L. Longe (ed. ), The Gale Encyclopedia of Medicine, 2nd edition, volume 4. Detroit: Gale Group/Thomson Learning. ISBN 0787654930. This page was last modified on 12 August 2008, at 05:08.